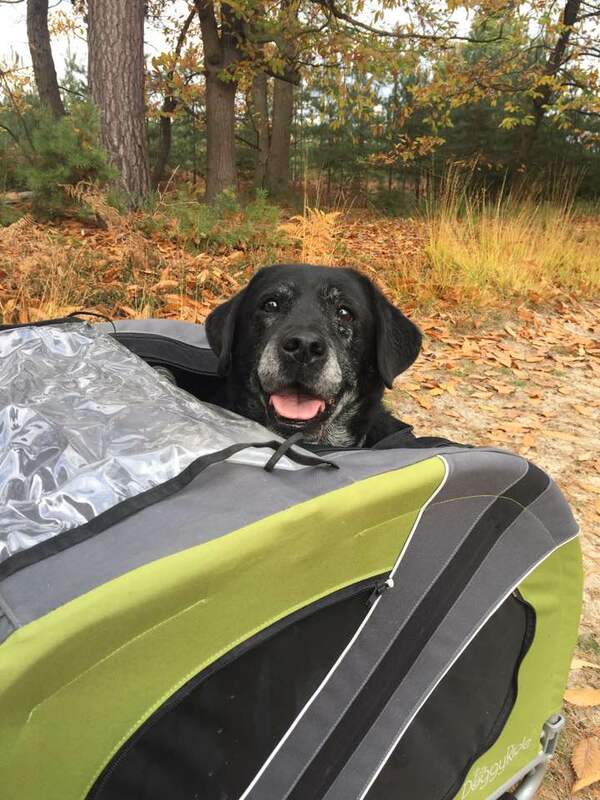 Living with an elderly dog – are you prepared? Tillie wet her bed last night. The other day I didn’t open the back door quick enough after she ate dinner, which meant the poop that was supposed to be outside ended up inside the back door. I walked into the kitchen and she was there; I went upstairs to the bedroom and she followed me there too. I turned around and almost fell down the stairs, because she was there too. The behaviour you’d expect from a puppy, not an elderly dog. 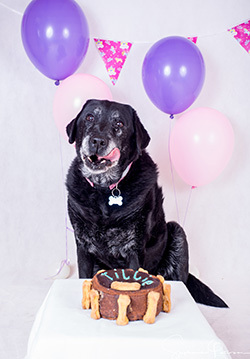 You see Tillie is now 15. She can’t see properly due to cataracts, she’s almost deaf and on a walk, there’s more time spent sniffing the same piece of grass 15 times than there is walking. That means we don’t actually get very far. We think she has a touch of dementia, and forgets to empty her bladder, so we have to push her out the back door every now and again. When we forget, she wets the bed! She is one of the happiest dogs we know! She wags her tail almost constantly, especially when hoovering down her dinner. When she could hear, whilst she was scoffing her food, we’d love to call her name and watch her tail go faster. Can’t hear? No problem, a gentle touch to her rump gets the same adorable effect! The rest of her body may be elderly, but that tail is still a puppy! Often, when we need to wake her up, our hearts sometimes take a jump as she appears not to be moving. Is this her time? Is this the moment we’ve been dreading? Then, with timing like a comedic actress, she takes a deep breath in, slowly opens her eyes and with a look of happy recognition wags her tail. She has a nasty growth under her chin. It’s almost certainly something nasty, but the only way the vets can tell for sure is to “put her out” and take a biopsy. If it is the big “C”, the treatment will no doubt be awful. So, as a family we’ve taken a decision. She’s happy, she still loves her food and every now and again likes to go on a walk. Who are we to take this away from her? So, we watch the growth, we watch her, we smile and we give her the best life she can possibly have. We held a cake smash for her 14th birthday, and although it’ll be late, she’ll be having one for her 15th too! Being elderly means you get to eat cake! When you take on that sweet little puppy, you expect to have to house train them; you expect to have to clean up their mess, knowing they’ll soon learn and grow up to be your faithful companion. But are you prepared to take on their little mistakes when they get old? Are you prepared for the smelly breath and lumps and bumps they’ll slowly develop? Becoming elderly often means having medication for arthritic pains; are you prepared to pay for them? Are you prepared for when they have to leave? Tillie is lying in her bed as I type this, every now and again looking up at me with her cataract eyes, enjoying the reassurance that “Mum” is close. Over the years she’s been my muse, often sitting still, staring somewhere, normally at me, whilst I shove my camera in her face. She is patient, has a way of playing that no other dog can understand, and although deaf, knows exactly when the treats have been taken out of the cupboard or the fridge. One thing is definitely for sure – I will be taking as many photos of her as I can. Photos I can put on the wall to remember her character and the many years we’ve spent being loved by this beautiful old girl. This is especially important as I don’t have any really decent photos of her as a younger girl. Being a black dog, most of my earlier photos of her as a young’un are of a black blog. 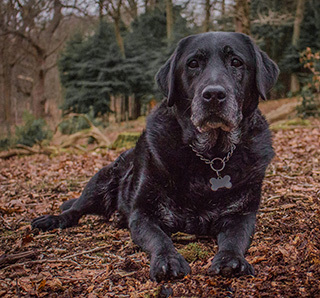 Thankfully, with training and years of practice, I’m now able to take beautiful photos of our gorgeous old girl. We’re prepared to live with an elderly dog. 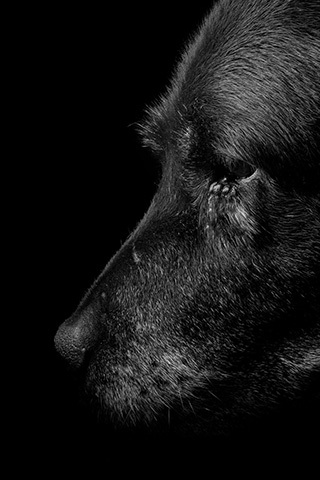 We’re prepared to give unconditional love to an old girl who has been and still is one of the my loyal dogs I’ve ever known. We’re prepared to pay her vet bills. We know it won’t be forever, but we do know she’s still enjoying her life, and we’ll enjoy her whilst we can. So my question to you …..